Marketing activities during the weeks leading up to the back to school rush offer real estate professionals excellent content ideas for connecting with your farm. Real estate agents who publish monthly or quarterly newsletters will want to use some of the same strategies online retailers use to attract attention to their products and services. One thing marketing gurus recommend is getting the kids involved. Since school is all about the kids, focus some content on their needs during this time. For example, if you are using a newsletter template, consider adding campus diagrams (or photos) that show the layout of the school grounds in the customization sections. Suggest parents and their children take the diagram with them when they visit the school as a way to familiarize themselves with key areas – the nurses station, administration office, lockers, cafeteria, water fountains and vending areas. This is especially important for children attending a new school this fall. Another successful tactic marketing agencies use is to get some help from well-established bloggers who understand the excitement and stress that surround the back to school period. Agents who have an online presence – and, who doesn’t these days, right? – know the value of combining different media channels to promote local properties. This time of year, along with highlighting homes on the market near neighborhood schools, invite a guest blogger to write a piece about transitioning from summertime schedules to school day routines for your online blog. Then, promote the piece across your other social sites like Facebook, Twitter and Instagram. Remember to check with your local paper to see if they might be willing to post the blog – with the author’s approval, of course – and include your blog address in your print media, such as newsletters, postcards, flyers, and direct mail pieces. Everyone loves a bargain. Double the pleasure by marketing recently reduced, deeply discounted property information and back to school free tax day notices at the same time. At last count, 18 states offer a tax break on school-related purchases. This is a great way to show prospects you want to help them get the most value out of every hard earned penny. We hope these three marketing tips inspire you to create award winning back to school campaigns. ReaMark offers hundreds of beautiful, customizable marketing solutions to help you build relationships. 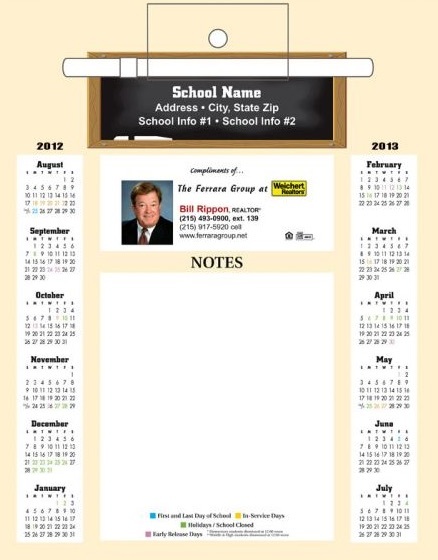 We also offer a wide area of soft-sell promotional items to keep your brand in front of neighborhood residents all year-round including magnetic school memo boards and refrigerator magnets.